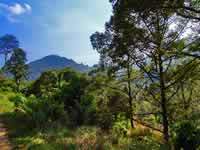 www.KoChangVR.com - Virtual travel & island guide with property on Ko Chang in the Gulf of Thailand. Your Browser can't show embedded Frames: You can't see the navigation with the links to the other hotels with booking possibility. Please go to these hotels by using the navigation on the left side above! Building sites / building plot grounds at Klong Son Bay to lease out longtermed or for sale! The building plots are located just a few hundred metres before the Nam Yom Waterfall at Klong Son Bay - have a look at the map: just click the Ko Chang logo top left. There a new housing area on a 10 Rai plot (10 Rai = 16.000 m²) comes into being (panorama pictures on the left and right: parts of the building ground). The whole building ground is about 110 metres wide (along the road) and about 145 metres long (up the slope). No trees were cut down so the houses will all have enough shadow. The individual plots have a size of 400 m² and will follow the landscape. The building plots are to let on a lease for 99 years. A buying option can be negotiated with the owner. the residential house with 1.000 m² land on the right side (for more information click the link below). 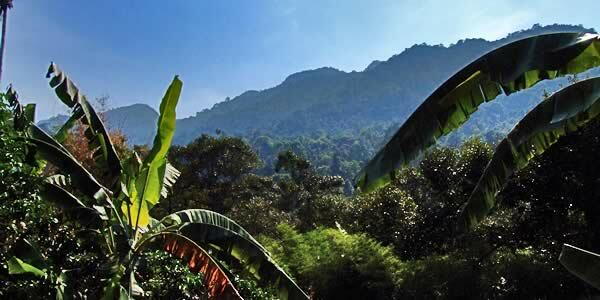 The project will come into being in the probably most beautiful valley on Ko Chang (see panorama picture on the left), about 5 kilometres from the village of Klong Son (Baan Klong Son), direction south. 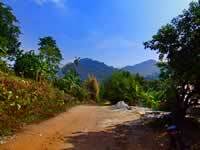 It’s situated only a few hundred metres from the Nam Yom Waterfall and adjoins the road that comes from the village. Up to the last 200 metres the road is already asphalted. From the village of Klong Son it’s only a few hundred metres to the bay with the beautiful sandy beach, to White Sand Beach, the most popular beach on Ko Chang, it’s only about 3 km from there. Electricity and water is already available, mobile connection is guaranteed. Landlines for telephone and internet can be applied for. A few of the building plots are already leased out. Opposite there is a beautiful 1.000 m² plot with a residential house for sale. The price including the land is only 6.000.000.- Baht. More Information and pictures here: House with land for sale. Beside the residential house there is another building plot that can be leased or bought (see panorama picture on the right above). Due to the fact that the 10 rai building ground is situated at a slope all plots have view to the jungle covered mountains. Close by some of the wealthy bungalow resort owners also bought property for their private houses, which is an indication for the beautiful area and the stability of value of the building plots. For further information please fill in the form that will be guided to the land owner. But please be a little bit patient: the owner can’t check his emails daily so it may take a few days until you’ll receive an answer. and take care that your e-mail address is correct!